Football is full of cheap shots. We saw them this weekend during the first full week of college football. We also saw them in a High School game in San Antonio and during a halftime show. Two players from John Jay High School blind sided a referee during a game on Friday. Both has been suspended from school, football and could have criminal charges on the docket. No matter how bad a referee messed up they don’t deserve this. They are working out of a passion for the game and for very little money. There job is dangerous enough without having to get a cheap shot from a safety. On a less criminal note, the Denver Nuggets mascot Rocky levels a kid during a halftime show and then stands over him like Ali standing over Liston back in the day. Criminal charges are not pending here. They use to say that you should never work with kids or animals. Well if you are a minor league baseball team in El Paso, TX you just kind of do your own thing. Minor league baseball teams are known for their promotions to get people out to the ballpark but sometimes those promotions can be hard to wrangle. When you have won multiple Super Bowls and you are a five time All Pro, you get to have some fun every now and then. 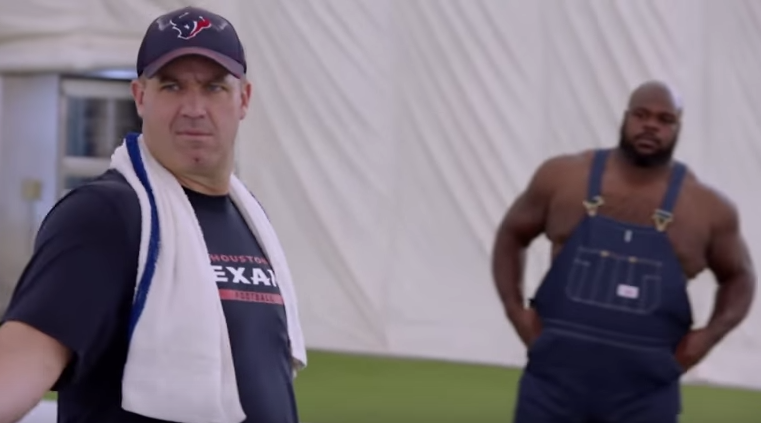 Vince Wilfork had some during training camp with the Houston Texans. He channeled his inner Texan when he showed up for a walkthrough. There are very few coaches in College Football considered to be a nicer guy than Washington’s Chris Pederson. Pederson showed why he is so well respected on Friday night after his Washington Huskies lost to his former team Boise State. After missing a field goal that would have tied the game and sent it into overtime, Pederson shook hands and hugged just about every single one of his former players. He was then given a standing ovation as he left the field. Being the nicest guy doesn’t always equal wins but it sure does command respect.